Spain owed its mighty Empire to the wealth that flowed in from the New World, and it owed its New World colonies to the conquistadors, ruthless soldiers of fortune who brought the powerful Aztec and Inca Empires to their knees. You can despise these men for their barbarity, greed, and cruelty, but you must respect their courage and audacity. In 1519, the ambitious Hernán Cortés set out from Cuba with 600 men on an expedition to the mainland in present-day Mexico. He soon came into contact with the mighty Aztec Empire, home to millions of citizens and thousands of warriors. By deftly exploiting traditional feuds and rivalries among the tribes that made up the Empire, he was able to conquer the mighty Aztecs, securing a vast fortune and noble title for himself. He also inspired thousands of Spaniards to swarm to the New World to try and emulate him. Francisco Pizarro took a page from Cortes' book, capturing Atahualpa, Emperor of the Inca, in 1532. Atahualpa agreed to a ransom and soon all the gold and silver of the mighty Empire was flowing into Pizarro's possession. Playing off Inca factions against one another, Pizarro made himself master of Peru by 1533. The natives rebelled on several occasions, but Pizarro and his brothers always managed to put these insurrections down. Pizarro was killed by the son of a former rival in 1541. All of the conquistadors who came to the New World were ruthless, tough, ambitious, and cruel, but Pedro de Alvarado was in a class by himself. Known by the natives as "Tonatiuh," or "Sun God" for his blonde hair, Alvarado was Cortés' most trusted lieutenant, and the one Cortés trusted to explore and conquer lands to the south of Mexico. Alvarado found the remnants of the Maya Empire and using what he had learned from Cortés, soon turned local ethnic groups' mistrust of one another to his advantage. You probably had to be a little crazy to be a conquistador in the first place. They left their homes in Spain to spend months on board a rickety ship to the New World, then had to spend years in steamy jungles and frosty sierras, all the while fighting angry natives, hunger, fatigue, and disease. Still, Lope de Aguirre was crazier than most. He already had a reputation for being violent and unstable in 1559, when he joined an expedition to search the jungles of South America for the legendary El Dorado. While in the jungle, Aguirre went mad and began murdering his companions. Pánfilo de Narváez just couldn't catch a break. He made a name for himself by ruthlessly participating in the conquest of Cuba, but there was little gold or glory to be had in the Caribbean. Next, he was sent to Mexico to rein in the ambitions Hernán Cortés: Cortés not only beat him in battle but took all of his men and went on to conquer the Aztec Empire. His last shot was as leader of an expedition to the north. It turned out to be present-day Florida, full of swamps, thick forests, and tough-as-nails natives who didn't appreciate visitors. His expedition was a disaster of colossal proportions: only four out of 300 men survived, and he was not among them. He was last seen floating off on a raft in 1528. Diego de Almagro was another unlucky conquistador. 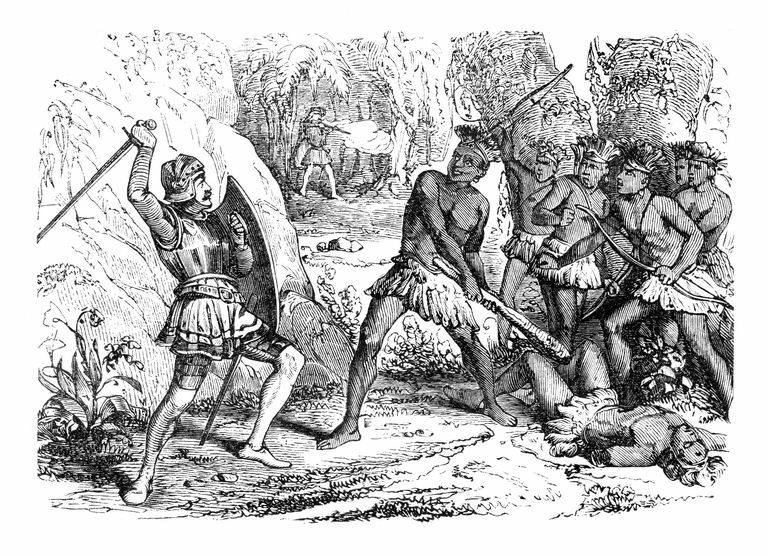 He was a partner with Francisco Pizarro when Pizarro looted the wealthy Inca Empire, but Almagro was in Panama at the time and missed out on the best treasure (although he showed up in time for the fighting). Later, his quarrels with Pizarro led to his leading an expedition south, where he discovered present-day Chile but found little more than harsh deserts and mountains and the toughest natives this side of Florida. Returning to Peru, he went to war with Pizarro, lost, and was executed. Vasco Nuñez de Balboa (1475-1519) was a Spanish conquistador and explorer of the early colonial era. He is credited with leading the first European expedition to discover the Pacific Ocean (which he referred to as the "South Sea"). He was an able administrator and popular leader who cultivated strong ties with local tribes. Francisco de Orellana was one of the lucky ones who got in early on Pizarro's conquest of the Inca. Although he was richly rewarded, he still wanted more loot, so he set off with Gonzalo Pizarro and more than 200 Spanish conquistadors in search of the legendary city of El Dorado in 1541. Pizarro returned to Quito, but Orellana kept heading east, discovering the Amazon River and making his way to the Atlantic Ocean: an epic journey of thousands of miles that took months to complete. Hernan Cortes had many subordinates in his epic conquest of the mighty Aztec Empire. There was none he trusted more than Gonzalo de Sandoval, who was barely 22 when he joined the expedition. Time and again, when Cortes was in a pinch, he turned to Sandoval. After the conquest, Sandoval was richly rewarded with lands and gold but died young of an illness. By 1542, Gonzalo was the last of the Pizarro brothers in Peru. Juan and Francisco were dead, and Hernando was in prison in Spain. So when the Spanish crown passed the famously unpopular "New Laws" restricting conquistador privileges, the other conquistadors turned to Gonzalo, who led a bloody two-year revolt against Spanish authority before being captured and executed.